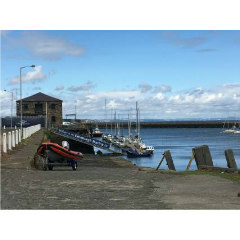 In 1849, the Edinburgh, Perth and Dundee Railway Company commissioned the famous Victorian engineer Sir Thomas Bouch (1822 – 1880) to design and build a ferry service at Granton. Whatever the tide level, this service would be able to load and unload railway carriages and freight wagons between Granton and Burntisland across in Fife. To accomplish this, a specifically-designed vessel, the Leviathan – the first of its kind in the world – was needed. 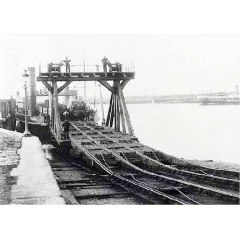 The ship, built on the Clyde, had two engines, mounted port and starboard over the paddles, so the main deck had maximum stowage for the railway carriage cargo. 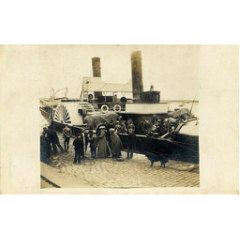 By October 1879, a new steam powdered passengers ship, the William Muir, was brought into operation. The Leviathan service ended in 1890 when the Forth Railway Bridge opened, but the “Willie Muir” went on for another 47 years and it is estimated she carried over three-quarters of a million passengers. After WWII, four more ferries were brought into operation, including the Bonnie Prince Charlie which could carry 30 cars and passengers and even had a coffee lounge and cocktail bar. 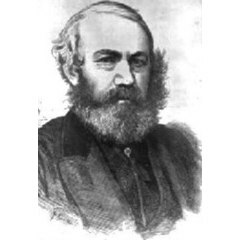 Sir Thomas Bouch (25 February 1822 – 30 October 1880) He introduced the first roll-on roll-off train ferries in the world, across the Firth of Forth from Granton to Burntisland in Fife on 3 February 1850. Others had had similar ideas, but Bouch put them into effect, and did so with an attention to detail, such as design of the ferry slip.